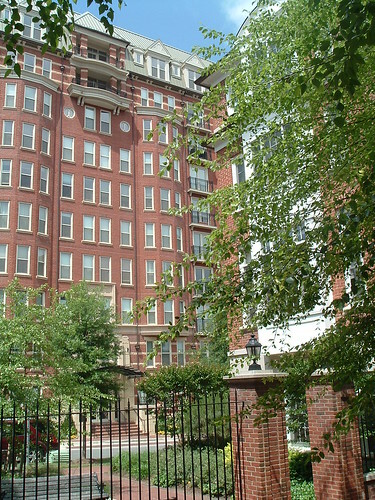 Leonard Greenberg developed these buildings in Bethesda. And he'd do the same in Wheaton if given a chance. While County Executive Ike Leggett wants to give developer B.F. Saul $40 million of public funds to build on public land in downtown Wheaton, one developer's been building here with minimal help from Montgomery County. His name is Leonard Greenberg, and since the mid-1980's, his company Greenhill Capital has acquired nearly a third of downtown Wheaton, dreaming of what the area could become. When the county's zoning restrictions forced him to sit out the real estate boom, Greenberg decided to keep waiting while hatching bigger and grander schemes. "Wheaton should be more of an Adams Morgan"
New apartments like these on Georgia Avenue, says Greenberg, will help local businesses in Wheaton. Greenberg grew up in the D.C. area, living briefly in Wheaton during the 1950's. After working for a Boston-based real estate investment firm on their D.C.-area projects, he struck out on his own and founded Greenhill Capital in 1974. In the 1980's, he began buying and developing properties in Wheaton, anticipating the opening of a new Metro station. "It was the last [central business district] that was scheduled to be developed" after Silver Spring, Bethesda and Friendship Heights, says Greenberg. "Plus, it was human scale. And there’s something about the small proprietors." 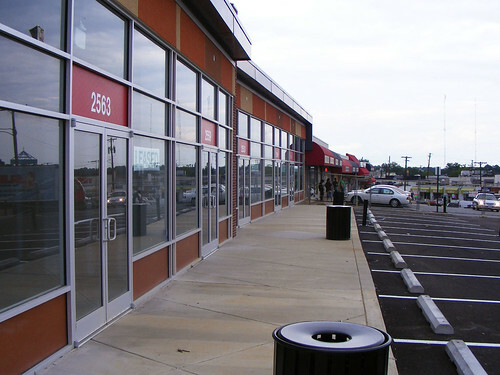 Most of Greenberg's properties in Wheaton are single-story retail buildings, many of which were designed by Rockville architect Steven Karr. But he's always itched to do something greater. As he told the Gazette last week, Greenberg sees Wheaton as the next Adams Morgan, a vibrant hub for entertainment, shopping and culture. Not only that, but he knows how to do it. "I’m a johnny-one-note. I've been saying this for 25 years, to get people on the street. I'm an urbophile. I'm a believer in 'city.' I get it." If Greenberg had his way, he'd change liquor licenses to allow up to 75% of a venue's total sales to be alcohol, drawing bars and clubs. He wants a "county sponsored lease plan and economic program" to fill empty stores with theatres, artists and even university ventures. And he would've made sure that businesses displaced by redevelopment stayed in the area, unlike Barry's Magic Shop, which was condemned by the county to build a pedestrian walkway and received $260,000 to move to Rockville. Finally, Greenberg would build lots of housing, both downtown and in surrounding neighborhoods, to create more foot traffic that can support local businesses. He's not convinced that B.F. Saul's plan to build offices over the Wheaton Metro will pencil out. "It costs as much to build in Wheaton as it does in Friendship Heights, but the rent multiplier is significantly higher," he explains. In other words, tenants will pay more for an office in Friendship Heights than in Wheaton, no matter how nice it is. Meanwhile, rents for apartments in Wheaton are the same as those elsewhere in the county. "The county will have to heavily subsidize that office building," Greenberg told me on Monday, two days before Leggett's announcement. After our talk, I e-mail Greenberg to ask what he thought about the $40 million subsidy B.F. Saul could receive. "Development would have occurred in Wheaton with bolder (even traditional urban) planning, but the county was too lazy and too anti-business for change to naturally evolve," he replies. "We never considered a [government] subsidy . . . on any of our other projects." Triangle Park, a shopping center developed by Greenhill, shown in 2010 before being leased. According to Greenberg, any attempts to take Wheaton beyond the strip mall have been stifled by local opposition and red tape. "Boy, do I try to do more and better there," says Greenberg, "and you cannot imagine the resistance we have." In 1990, the county passed a plan for downtown Wheaton that instituted a "Retail Overlay Preservation District." (See a map of it here.) The district was supposed to protect small businesses while ensuring that new construction was of high quality. However, by limiting the density of new development and requiring that all new buildings be reviewed by the Planning Board, even ones that complied with the zoning code, it actually repelled investment. "I absolutely abhor what the county has been doing all these years" in Wheaton, says Greenberg. "What they needed to do is have more density, more people to walk and support the urban core." Upon buying the Anchor Inn restaurant at Georgia Avenue and University Boulevard in 2004, Greenberg envisioned redeveloping it with new housing and shops. It was the height of the real estate boom, when new apartments and townhouses were being built at the edges of downtown Wheaton. However, his proposal to build a 600,000 square feet mixed-use development on the site went nowhere because the county took too long to finish a new plan for the downtown, which was finally approved last year. "They wouldn't repeal the overlay district" in time, he grumbles. In a Gazette article from 2006, Greenberg lamented that Wheaton "missed the train" on the economic boom. Instead, he built what zoning allowed: the smaller Georgia Crossing project, a series of one-story retail buildings that one resident called underwhelming. "In the 1950's and 60's, Montgomery County was the standard by which suburbia was to be developed," Greenberg says. "The Wedges and Corridors [Plan], blah blah blah. But as we became more urbanized, they . . . tried to impose suburban standards on urban locations, without consideration to alleys and deliveries and urban edge and human scale, doors at the urban edge and creating a liveliness that was required." That said, Greenberg isn't doing terribly in Wheaton. He calls me out for using the above photo of Triangle Park, a shopping center at the intersection of Ennalls Avenue and Veirs Mill that he rebuilt after a large fire in 2008. The photo was taken in 2010 and shows the complex when it was new and empty. "That space has been leased for 18 months," says Greenberg. "We’re getting mid-$30's [the leasing rate per square foot] and the parking lot is always full." Not all of his tenants have been happy, though. 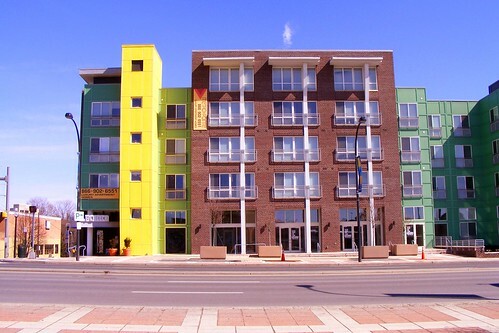 In 2010, the Gazette interviewed several disgruntled former tenants who spoke of broken contracts and unfairly high rents. One of those tenants was Eddie Velasquez, whose DeJaBel Café at Greenberg's Georgia Crossing shopping center opened in 2008 and closed 14 months later. Greenberg says it's simple why DeJaBel closed. "If you owned a coffee shop, when would you open?" he asks me. "I guess 6 or 7 am, for people going on their way to work," I say. "He opened at 9," Greenberg replies. Nonetheless, he says, Greenhill Capital got Velasquez a liquor license so the cafe could stay open at night, but even that wasn't enough to keep them in business. Cavan Wilk, who writes for GGW, suggests that it was a lack of foot traffic that killed DeJaBel Café, which wouldn't have been a problem if Greenberg had been able to build apartments on top. "We're not apologizing" for the work Greenhill does, Greenberg says. "Think about the jobs we’ve created. We start people in businesses and we keep people in business." "No one asked me to do it"
Greenhill Capital developed this office and retail building in downtown Bethesda, shown in 2009. One place where Greenberg sees the county doing something right is in downtown Bethesda, where Greenhill Capital's headquarters are located. The difficulty of doing business elsewhere in the county, whether it's Wheaton's retail overlay district or limits on procuring liquor licenses, sends people here, Greenberg says. Not surprisingly, the handful of projects Greenhill has built here are much better than those in Wheaton: buildings close to the street, a mix of uses, and little aesthetic flourishes here and there. And no parking lots. On Cordell Avenue, a pizzeria he developed features trompe l'oeil, or an optical illusion of fountains along the sidewalk. "No one asked me to do it," Greenberg says. "I did it." 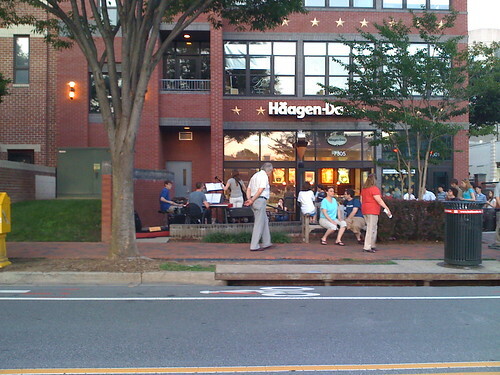 Over at Woodmont Avenue and Elm Street is what Greenberg calls "the Haagen-Dazs building" after its former ground-floor tenant, which has since moved down the street. The building remains a nice, and fully-occupied, piece of urbanism: it's a mix of retail and office space, has lots of windows facing the street, and a little plaza in front that is occasionally used for concerts. Then there's the Edgemoor shown above, a complex of condominiums and townhomes on Montgomery Lane that was developed by Greenberg and built by three local builders. He rattles off a list of high-end features: "Real copper gutters and downspouts, slate roofs on the end units, oak doors," he says. "And until they screwed it up, Georgian gardens. I had these really nice Georgian gardens, but they took out all of the benches." Greenberg also lives in the high-rise building, which looks like an old-school New York apartment house. "I wanted something between the Dakota and the Plaza," he says. Yet these accomplishments generally go unnoticed east of Rock Creek Park, where Greenberg's been depicted (including on this blog) as an unscrupulous landlord and purveyor of strip malls. "Nobody talks about the stuff that we’ve given or the contributions we’ve made," he says. "To put your name on the line for a construction project is far different than throwing spitballs at it." As a result, Greenberg is content to wait. "We got so frustrated with the process [in Wheaton] that we said we’ll go forward and we’ll wait for the next generation to take it to the next level," he says. "We are constrained by a non-business friendly environment, and Montgomery County's paid the price for that. Developers are not willing to take the risk." And they'll sit on their substantial holdings in Wheaton until everyone else comes around. "We have enough ground for 1.5 million square feet" of development under current zoning, he says. "We’re interested in the right kind of deal. We’re not interested in selling." He adds, "We’ll see if Wheaton's time is now." Extremely interesting. I certainly agree that zoning is an issue in Wheaton and good lord the liquor laws need to be changed in this county. I think Greenberg is certainly correct that the county needs to do more to focus on smart urbanism in Wheaton (and everywhere else, for that matter). Seems like most of the county's focus has been on North Bethesda/355 and Wheaton/Georgia Avenue has suffered from being on the back burner. I certainly wish Greenberg and Wheaton the best. And it seems like the county finally *gets it* by trying to jump start the process with $40 million for big developer. Yet all we're going to hear on this site and others is more whining about saving the "mom and pops." As we now know, developers like Greenberg own all those shops, not mom and pop. Let the loan happen and let's get Wheaton caught up with the rest of the county. Go Greenberg! Definitely worth reading all the way to the end! Thank you Dan. I'm not sure about the $40 million if the project is not economically feasible from the start. Lenny has always been an upfront person. Clear about the challenges and his objectives, he is right about so much of the regulatory experience. He gets many points for sticking with us.